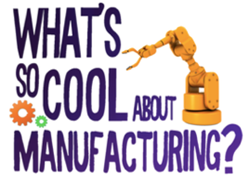 Public voting for northeastern Pennsylvania’s inaugural “What’s So Cool About Manufacturing?” (WSCM) Student Video Contest will open Monday, March 19, 12:01am and run until Wednesday, March 21, 11:59 pm at the new http://www.whatssocool.org website. Everyone throughout the northeastern Pennsylvania community is welcome and encouraged to vote! The video with the most votes will receive the “Viewers’ Choice Award.” The videos will also be reviewed by a panel of judges for awards in five other categories, including Outstanding Creativity and Outstanding Coolness. Presented by the Northeastern Pennsylvania Industrial Resource Center (NEPIRC), the WSCM Student Video Contest, gives 8th grade students in Lackawanna, Luzerne, Monroe, Pike and Wayne counties the opportunity to connect directly with local manufacturers, discover what is "cool" about today’s manufacturing industry and record their experiences with GoPro cameras while creating an educational documentary video. The contest was created to generate excitement that draws students towards considering manufacturing career paths. Partnering with NEPIRC for the project are Manufacturers Resource Center, PBS 39, Sahl Communications, Inc., the PA Department of Community and Economic Development, Lackawanna College, PPL Electric Utilities, the National Institute of Standards & Technology and NEPIRC’s Board of Directors. For more information visit http://www.WhatsSoCool.org, facebook.com/WSCMNE and https://twitter.com/WSCMNE. Developed by Manufacturers Resource Center (MRC), WSCM program is a video based educational tool that increases awareness of career paths in manufacturing. MRC developed this innovative career awareness program that at its core is "peer marketing" – kids telling kids what’s “cool” about today’s manufacturers. The contest is showcased on the What’s So Cool website and shared nationally through the Manufacturing Institute and the Manufacturing Extension Partnership platforms. Within Pennsylvania, 12 regions are conducting contests this year. NEPIRC is a not-for-profit organization that has been providing world-class professional services exclusively to manufacturers throughout northeastern and northern Pennsylvania since 1988. NEPIRC works with manufacturing clients on consultative engagements designed to address their unique challenges and maximize their profitability. NEPIRC promotes manufacturing in the region and helps small and medium-sized manufacturers generate business results in today's technology-driven economy. NEPIRC is committed to providing solutions to the region's emerging need for workforce development strategies that support manufacturing now and in the future.